Kodak, the company best known for its products related to the world of photography, has announced a new and highly anticipated smartphone, intended as the successor to the Kodak IM5 put on sale in June 2015. The launch of the new Kodak EKTRA had been anticipated by a teaser posted on the website of Kodak, but today has finally been confirmed, with images and specifications. Kodak is still alive and wants to fight in new markets. And no, not talking about the films that have already been forgotten for many, but the smartphone market. While the Kodak IM5 was a mid-range Android device with good features (announced at CES last year), we now know that the brand will launch a new cell phone that not only carry the logo of the glorious American company, but will include some of the details that made it great in the past. 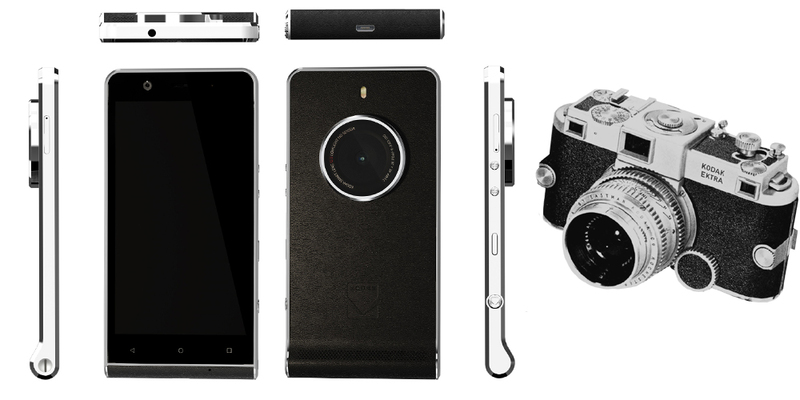 The name of the new smartphone refers to the Kodak EKTRA camera with same name launched in 1941, with a vintage design, leather imitation, and that has a leather case (if you will) that conveys echoes of the past. The similarities with the past, however, stop here: Kodak EKTRA is, in fact, a smartphone with Android 6.0 Marshmallow operating system, with a 5-inch screen with a resolution of 1080p, MediaTek Helio X20 Deca-Core processor, 3 GB of RAM and 32 GB of internal memory. Although the highlight is, of course, the part devoted to photography, the Sony IMX230 sensor with 21 megapixels mounted on the rear of the device. We know that this camera has already been seen on the Xperia Z3+ launched in 2015, but here is combined with a 26.5 mm fixed lens f/2.0. In short, Kodak EKTRA hits the market as another mid-range smartphone, but difficult to classify. The photos posted on the website dedicated to the miracle not positively draw attention, and one will even think it's an ugly device. However, if you want to try, you should know that its arrival in Europe is expected for December at a price of 500 €.